The actor would stand firm against temptations and report to his wife at regular intervals while filming. 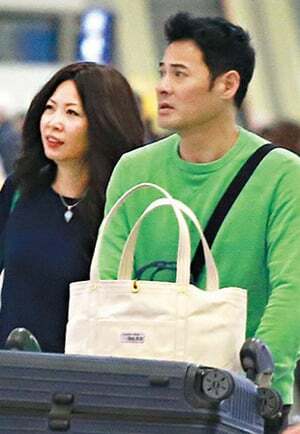 TVB actor Ben Wong (黃智賢) and his wife, who is not from the entertainment industry, have been married for 15 years, after dating for 14 years. Despite their seemingly stable and loving marriage, Ben shared that their relationship too endured its fair share of challenges over the years, as his wife had to put up with staple industry gossip while Ben had to fend off actresses who made improper advances towards him. Being in the complicated entertainment circle, Ben admitted that he had also experienced marriage crisis. Whenever he encountered actresses who tried to make advances at him, he would firmly state that he is a married man to avoid walking down the wrong path. Besides taking care of their dog together, the couple would go on frequent travels to inject freshness into their relationship. Recently returning to Hong Kong from their trip, the couple, who had spent almost three decades of their lives with each other, looked sweeter than ever. Despite this, Ben’s career choice means that he has faced his fair share of improper advances. To build trust in his wife, he would take the initiative to report to his wife during filming intervals, slowly earning her trust over time. “We are in different industries; her circle of friends aren’t celebrities. , over the years she has heard many rumors and gossip. For example, ‘There are many gorgeous women at the station’. Any couple would go through these challenges, and we are not different. As the saying goes, ‘If you cheat once, you can’t be trusted a hundred times’; Acting sneakily even once is enough to break the trust,” said the 51 year-old actor. This is my first time seeing his wife. I always find Ben and Kevin Cheng looks alike. Glad he’s a good husband and I think it’s okay for them not to have any children many couples don’t have any children too they’re still a happy couple as long they’re happy that’s all matter. @cutie777 Eh? Kevin Cheng and Ben Wong are on different levels lol…. @megamiaow ben is a good actor. he is convincing in any role given to him…from a baddie as ‘spicy ginger’ to acting effeminate. @tungamy Kevin was charming in forensic heroes 2, yummy yummy and scarlet fever…I was head over heels. yes, he has that kind of handsome one will not get tired looking at even after a long time. Kevin has aged a great deal after scarlet fever and even more obvious now. There are so many reasons not to have children in this day and age…I can’t say I disagree with childless parents for not wanting them. The ones who don’t have children live very enviable, carefree lifestyles. The flip-side being that they’ll never have children to offer companionship, but when they establish strong friendship with people who are also childless…the companionship exists. I can see both sides of the coin, having somewhat raised siblings myself and knowing the joy of kids, yet at the same time, the burden of responsibility towards them. @coralie if a couple decides not to have kids, then they would have to stand firm all the way. some find kids missing in their lives few years down the road and get desperate. not having kids means the couple can apply leave and pack up fo a holiday anytime. having kids has pros and cons.